If you love barbecue, you won’t want to miss the fourth annual ‘Cue for a Cause on Sunday, September 2 from 12-8 p.m. This barbecue cook-off contest and family fun festival features live music, a play area for kids, a bag tournament, and of course, great barbecue! The event will raise money for the Elmhurst Walk-In Assistance Network. At Elmhurst Toyota, we love a good barbecue and hope you can attend ‘Cue for a Cause this Labor Day weekend. 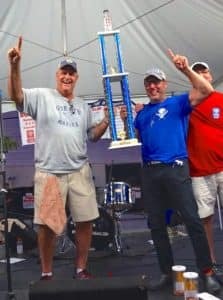 Teams of backyard chefs will compete for cash prizes in the categories of best ribs, chicken and homemade barbecue sauce. Points are awarded for each category, and the team with the most points wins the title of Grand Champion. You can help determine the People’s Choice Award, which goes to the team who created the best barbecue sauce based on taste, appearance and aroma. Watching all that barbecuing is bound to make you hungry, so Barbeque Jim’s food truck will be there selling its mouth-watering pit-roasted barbecue and other American-style comfort food. You can also buy beer, wine and non-alcoholic beverages. Don’t forget to buy raffle tickets for a chance to win some great prizes donated by community businesses and organizations. Some of last year’s ‘Cue for a Cause raffle prizes included tickets to Sox, Cubs, Hawks and Bears games. With your purchase, you’ll also be supporting the Elmhurst Walk-in Assistance Center. The all-volunteer assistance center has served the community since 1997 through the generosity of local service organizations, churches, individuals, businesses and government offices. Assistance Center volunteers respond to those in need by providing referrals to appropriate services. The center may also help clients with vital needs such as paying for prescriptions, utilities or transportation. September 2, 2018, 12-8 p.m.
Free. Food, beverages and raffle tickets are available for purchase. Visit www.ewanet.org, call 630-782-6006 or email walkin97@ewanet.org.